Shawnee State’s Bailey Cummins is flanked by Wayland Baptist’s Deborah VanDijk as the sophomore drives into the lane on Friday evening. BILLINGS, Mont. — The 2017-18 campaign that the Shawnee State women’s basketball program had was truly one for the history books. In fact, it was a campaign that was so strong, in fact, that it would provide an excellent story for anyone to produce, even if it didn’t have the storybook ending desired by all involved. Despite a brilliant shooting performance from Hannah Miller and additional strong contributions across the Shawnee State women’s basketball lineup, the Bears fell to Wayland Baptist (Texas), 79-69, in the second round of the NAIA Division I Women’s Basketball Tournament on Friday evening. But the loss, however, will not dampen the pride and spirit that Jeff Nickel has for this program — or the 10 players that worked so incredibly hard to make the season what it was. After falling behind to Wayland Baptist by a 19-15 count after a quarter of play, a 13-5 run by the Flying Queens allowed the Plainview, Texas-based school to grab its largest lead of the affair, 32-20, with 3:36 to play in the second quarter of action after Gabby Gonzales came off of the bench to score five straight points. But with her team needing a spark, Hannah Miller didn’t let the light grow dim on Shawnee State’s chances in the contest. The Coal Grove native ultimately knocked down a pair of treys en route to starting a personal 12-6 run that cut the lead in half as the junior ultimately went 7-of-7 from the field during the contest. Still, Shawnee State hung around. Wayland Baptist kept the lead hovering around four points over the majority of the third quarter as the teams traded counterpunch after counterpunch, but a 10-point third quarter spurt by Madison Ridout, along with a huge putback by Sienna King with just three-tenths of a second to play in the third quarter, allowed the Bears to close in on the advantage as Shawnee State trimmed the Wayland Baptist lead to a 53-51 tally at the end of the third quarter of play. The Flying Queens’ assault, however, proved to be tough to crack. In the final quarter of play, Deborah VanDijk and Maci Merket exploded out of the game as VanDijk’s low post play and Merket’s five fourth quarter points put Wayland Baptist up by a 62-57 count with 5:42 to go in the contest. Miller and Bailey Cummins, however, countered for the Bears. The former, who scored a game-high 22 points, and the latter, who scored eight of her 15 points in the final frame, combined to knock down three of Shawnee State’s eight treys in the final quarter of action, with the final one by Miller knotting the score at 64 apiece with 3:42 to play — marking the first time that Shawnee State hadn’t trailed since the 1:34 mark of the first quarter of action. Unfortunately, VanDijk and Jada Riley had different plans. The pair, who accumulated 19 points and 12 rebounds to go along with 17 points, seven rebounds, and five assists, combined for two critical and-ones and added an additional pair of scores in the paint to fuel a 12-0 Wayland Baptist run over 3:05 of that final 3:42. 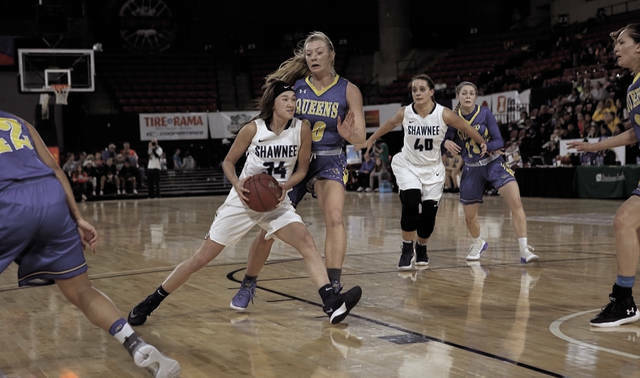 By the time Shawnee State finally stopped the bleeding, it was too late to make a serious push for the point — with five turnovers that led directly to Flying Queens baskets over the duration of the affair adding to the ultimate result. With the defeat, Shawnee State concluded its season at 31-4 overall with the season-ending loss. While the Bears do return four of their starting five (Cummins, Miller, King, Ashton Lovely), along with Shania Massie, Hagen Schaefer, Laken Smith, and Leah Wingeier off of the bench, SSU will have to say goodbye to two special seniors in Madison Ridout and Lydia Poe as they will depart the program for the final time.